The analysis led by White Glo looked at the last ten years* of Academy Award nominees and recipients across individual acting categories such as Best Actor, Best Actress, Best Supporting Actor and Best Supporting Actress noting whether they exhibited pearly whites. Blockbuster stars such as Leonardo DiCaprio and Meryl Streep are just two of the award winners able to flash their wonderful white teeth on the red carpet, with 38 winners out of 44 (86%) exhibiting what can be termed ‘a Hollywood smile’. By comparison, although plenty of non-winning nominees had winning smiles, 22% of nominees’* had something less than wonderfully white teeth – and ultimately ended-up with less to smile about. A few award winners in the individual acting categories tended to adopt a noticeably whiter smile in the build up to their award winning performances such as J.K. Simmons who took up a whiter smile a year before winning an Oscar for best supporting actor. Not every award winner had a Hollywood smile during filming, with the most successful award winning actors needing to transition to more rugged styled characters reminiscent of different eras. Three-time award winner Daniel Day-Lewis was able to transition between a 19th century oil prospector, 16th president Abraham Lincoln and a dressmaker from 1950s London all characters worn down by the hardships of everyday life in each of his wins.While Daniel Day-Lewis was able to adopt a whiter smile on the red carpet, Austrian star Christoph Waltz kept the same rugged smile while taking home two Oscars in 2013 and 2010 accounting for 5% of the total wins in the last decade. Unusually, in 2011 Jesse Eisenberg was the only nominee out of five (1/5) leading actors exhibiting a Hollywood smile in 2011, while Colin Firth’s adaptation of King George VI in the King’s Speech earned Firth’s only Oscar without a white smile. This year, the team at White Glo are predicting that Rami Malek will take home best actor for his leading role as Freddie Mercury in Bohemian Rhapsody. Although he will face stiff competition from the likes of Christian Bale, Bradley Cooper, Willem Dafoe and Viggo Mortensen. If trends are anything to go by, Rami Malek, Bradley Cooper and Viggo Mortensen are the three most likely nominees’ to win at the 2019 Oscars. Teeth whitening among Hollywood stars have become widespread within the film industry, becoming an essential part of the movie-star image. However, for those wanting to achieve a Hollywood Smile, getting the look needn’t break the bank. This particular formulation was originally developed for film actors and models – professionals who require utmost facial beautification. Its special Extra Strength formulation lightens discolouration and yellowing on tooth enamel which is often caused by food and drinks with strong colouring. 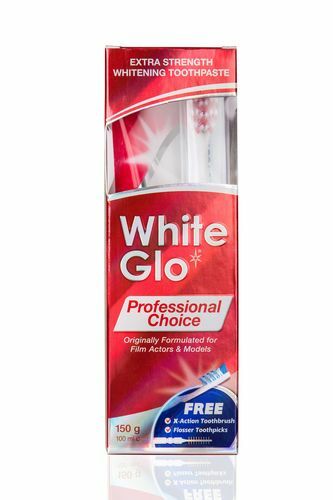 Following its launch, White Glo’s Professional Choice was rated most-effective whitening toothpaste by a leading consumer trial. * With regular use, it will help restore your teeth’s glamorous shine giving you a radiant smile. What’s more, its low-abrasion formula protects cavities making it a safe and suitable treatment for everyday use. Complete your oral hygiene routine by using the free X-Action toothbrush and dental flosser toothpicks available in every pack. •220 total nominee’s from 2008 to 2018. *80th – 90th Academy Awards, 2008 – 2018. This press release was distributed by ResponseSource Press Release Wire on behalf of Kin Communications2 in the following categories: Entertainment & Arts, Women's Interest & Beauty, for more information visit https://pressreleasewire.responsesource.com/about.